The art of combining design and build under one umbrella requires a firm to understand both the visionary prowess of the design process and the hands-on craftsmanship and pragmatic rigor of the construction process. Seattle residents like to reflect that handsome Pacific Northwest aesthetic, and firms that can provide custom wood accents are particularly popular among Seattle homeowners. The custom home builders & design-build firms listed below offer progressive, contemporary design and artisan construction. Many of Seattle’s design-build firms are modest teams who focus solely on residential design and execute stunning work using small-scale resources, though a few of the design-build firms listed below have a larger staff and a more national reach, or a more versatile project-type portfolio. All of them share the common thread of attention to detail, innovative solution cultivation, and custom elements that truly make a space unique to a client’s vision. Lee Edwards Residential Design enjoys using the holistic model of design and build to guide homeowners through the creative envisioning aspects of designing and the practical rigors of constructing. Edwards prides himself on creating homes that reflect the lifestyle and personality of its dwellers, while also respecting the surrounding essence of the environment. Edwards was educated in architecture and grew his construction skill set through hands-on experience in the field. 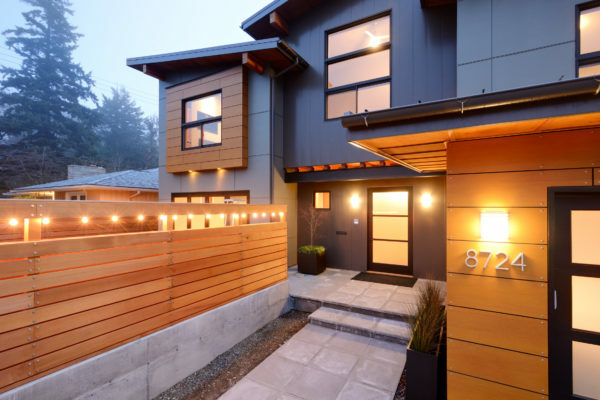 The Phinney Ridge residence simply glows with its contemporary, warm exterior, highlighted by douglas fir glulam posts and beams, powder coated steel railings, vertical cedar siding, and cedar shingles. Firm casement windows add to the warmth and cozy appeal of this Pacific Northwest aesthetic, as well as exterior overhang can lights and a gorgeous upper balcony. The open floor plan is well executed with a double height great room and a catwalk linking the upper floor bed and bathrooms. Wood interior paneling, made from fir, cedar, and cherry, simply enhances the rustic, inviting vibe. Lee Edwards Design implemented a modern, trendy interior for their five-star built Green home design of an handsome Seattle residence. The exposed wood beams, the floating staircase, the artistic light fixtures mounted to the walls, track lighting on wood-paneled ceilings, and large windows create a space that is view friendly, light welcoming, and lovely. In 2003, Bakken was founded with the aim to execute projects that cultivate strong personal relationships between the Bakken team and their clients. The firm enjoys working on a versatile array of challenges, including custom fabrication to remodels, additions, and entirely new constructions. The modest team of four includes owner and lead designer Joel Bakken, project manager and designer Aleksandr Romanenko, designer and apprentice carpenter Eduardo De La Fuente, and project manager and assistant carpenter Kyle Vauhn. The firm has appeared on Architizer and — though still growing their presence — does consistently impressive and high-quality work in the Seattle area. In the Greenwood neighborhood of Seattle, Bakken went to work on a residence that would reflect their client’s need for natural light, an open floor plan, three bedrooms, two bathrooms, a detached garage, and a contemporary, warm aesthetic. Their beautiful design and construction integrates dark steel beams with lush wood cabinetry and accents, gorgeous wood exterior paneling, and a well-executed mixture of natural light and soft interior lighting options. The stunning Medina residence is a 4,000-square-foot, two-story structure with an attached garage, that houses a family of five. An inviting patio with a cedar trellis, a guest suite, a classy contemporary kitchen with small-tiled backsplash walls, creative builtins placed in the entryway, and a wall of windows and French doors off the living room make this space both cozy and refined. CRD has been around since the early 1990s and was founded by Denny Conner. Conner, who is considered an early pioneer of the design build practice, has taught his design-build methods to various contractors throughout the nation. CRD’s work has been featured in The Seattle Times, on The Money Hour with Tina Mitchell, on the Master Builder’s Association of King and Snohomish Counties, and in Pro Remodeler. The team includes 16 members, and the firm receives glowing client reviews regarding their customer service, follow through, clear communication, kindness, creativity, and professionalism. CRD offers a full-scope process, from the initial design program meeting to construction completion, and they believe in the happy balance of achieving client’s dreams and respecting their budgets. A bungalow in the center of Seattle’s Fremont neighborhood was completely transformed by CRD’s keen eye for detail and innovative vision for renovation. Winner of the Best Green Remodel by the Master Builder’s Association in 2016, the home features metal roofing with solar array, energy-efficient appliances, low-E double pane windows, a 1,000 gallon rainwater storage tank, 97 percent raw marmoleum, and in-floor, radiant electric floor heat. The Ballard neighborhood residence remodel showcased CRD’s ability to work with a client’s specific vision and create a space that is personality reflective. Integrating the concept of “classic with a twist,” the space uses modern yet elegant updates, including a freestanding bathtub and a kitchen that fuses handsome dark cabinetry with hip light fixtures and a simple bar countertop. J A S Design Build, owned by Joe Schneider and Kim Clements, brings together a skilled team of designers, architects, craftsmen, and managers to collaborate on beautiful and inspiring homes that fit each client’s unique lifestyle. Schneider, who founded J A S in 1992 with his wife Kim Clements, received his education from the School of Architecture & Design at North Carolina State. Clements studied at North Carolina State, as well at the University of Washington. The firm’s work has been highlighted in Seattle Magazine, Seattle Met, This Old House, BH&G: Kitchens & Baths, Pacific Northwest Magazine, Gray Magazine and Better Homes and Gardens. J A S is dedicated to giving back in various ways. Among the organizations and events they’ve supported are Vets Restore, Lopez Island Family Resource Center, Global Visionaries, Water 1st, the John Hay MoveAThon, and the Public Interest Law Association. The firm’s work on a modern, charming, family-friendly bungalow features a handsome blend of traditional accents and modern splashes. Highlights include the mixed use of brick material on exterior bases; the classic dutch front door; the contemporary light fixtures, tiled backsplash, and gorgeous gray marble island in the kitchen; the enclosed sleeping porch; and the wood-paneled walls and ceiling of the airy, light-filled upstairs bedroom. The elegant Capitol Hill residence required a delicate balance of historic representation and progressive design. The firm needed to maintain the original integrity of the structure while creating an aesthetic that showcased the heritage of the space, yet integrating a more light-filled and urban visual appeal. Fabulous features include a staircase landing nook, ample builtins (even ones illuminated by shelving can lights), a white tile and white and gray marble bathroom with exposed silver piping, and a dutch door off the kitchen. CCM Architecture prides themselves on coming up with thoughtful solutions that lead to high-quality construction and a beautiful aesthetic. They aim to implement responsible building practices and integrate as many local materials and USA-made materials as possible. The modest team of five includes owner Charles C. Mellon, who is both an architect and general contractor and earned his Bachelor of Architecture from the University of Oregon. Mellon has specific expertise in carpentry and woodworking. CCM receives five star reviews for their talent, knowledge, ability to pick out nuances; their team effort; and their Northwest style and approach. The Blue Ridge historic remodel enriched and illuminated the charm of this handsome cabin space, using superior woodworking elements. Standouts include stunning shelves attached to stone-tiled walls, an incredible built-in breakfast nook, nicely finished wood kitchen cupboards, and simple, exposed wood ceiling beams. The airy, light blue bathroom is exceedingly welcoming, with a dark blue tiled backsplash wall and a unique configuration of bathtub and shower that allows for separation, yet an easy transfer from one to the other. The Crown Hill residence uses an open floor plan to create a sense of shared space and warmth. Steel and wood ceiling beams, high ceilings, a gorgeous kitchen island, and a handsome blend of wood and steel accents (including an industrial-looking caged staircase accent), makes the home feel spacious, contemporary, and cozy. 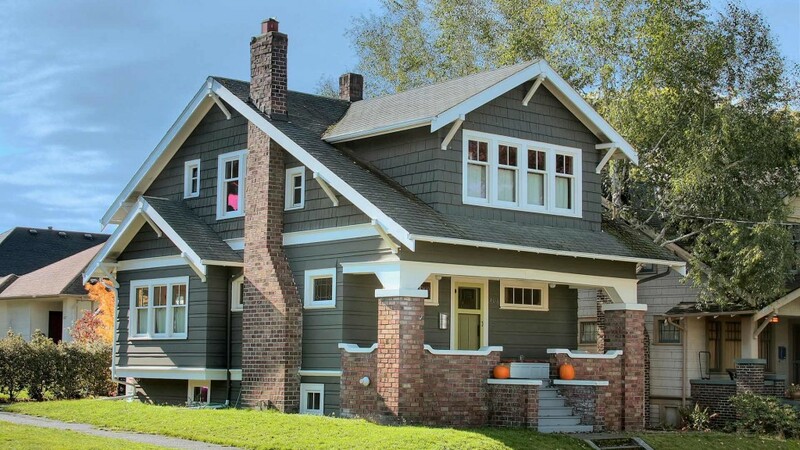 Gaspar’s Design + Remodel + Handyman has been working in the design and build industry for over 40 years, priding themselves on making Seattle homeowner’s dreams into realities. They aim to always respect the needs of timeline and budget, while bringing in creative design solutions and attention to detail. Sarah Henry is the second-generation owner of Gaspar’s, who grew up in Seattle and joined the family business in 2002. She received her B.A. in Human Resources from the University of Washington, as well as a Construction Management Program Certificate. She is part of Seattle Executives and the Women Presidents Organization. The firm has won numerous Remodeling Excellence Awards and was listed in the Top 50 Remodelers in the Country. The 1900s Seattle Home that Gaspar’s went to work on had a truly outdated 1980s kitchen, no master bedroom, and an unfinished basement — not to mention that the original windows were neither functional nor efficient. Not only did Gaspar’s work to remodel and recreate these aforementioned areas, but they also added a dormer to the house, a new fireplace surround on the main floor, and a Juliet balcony off of the sunroom. The new kitchen recalls traditional charm but spices it up with modern touches, like the bold, blue stove and the clean, white-tiled backsplash. The master bedroom has a glorious wall of windows and handsome, nook-like built-ins for seating and for storage. The 455-square-foot studio that was initially purchased as a second home and converted into a one-bedroom is a fantastic representation of what creative thinkers and builders can do with limited space. Storage was built into the living room, the kitchen and the bathroom were updated, and the wall between the living room and kitchen was removed to open up the home and make it feel more spacious. Charming features include the built-in breakfast nook bench and the built-in desk corner off the kitchen. MacPherson Construction and Design was founded by Roger MacPherson in 1983 and is based in Sammamish, Washington. The firm prides themselves on their ability to manage the many, multifaceted details of any given project from start to finish. The firm is especially experienced in waterfront design and construction, including the challenges and logistics of permitting. MacPherson Construction and Design has been recognized with the Corporate Citizen Award for Corporate Philanthropy, the Washington Aggregates and Concrete Association Award for Construction, 2nd Place in the 14th Annual Northwest Design Award for Best Individual Room, and the Puget Sound Business Journal’s Corporate Philanthropist Award for 2013. They’ve been featured in Street of Dreams, Residential Architect, Builder News, Better Homes and Gardens, Sunset, Pool & Spa, and Masonry Construction. 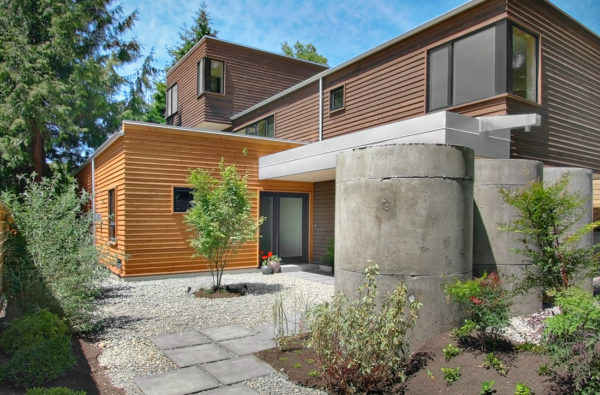 The Johnson residence utilizes a highly unique and innovate implementation of concrete in the design process that makes a bold, artistic statement. The colored and board-formed concrete in this custom home is textured with rich patterns with specially milled cedar from the local mill. The repeated use of this element throughout the home offers a sense of continuity and creates a contemporary, urban appeal. The home received awards for construction and design from the Washington Aggregate & Concrete Association. 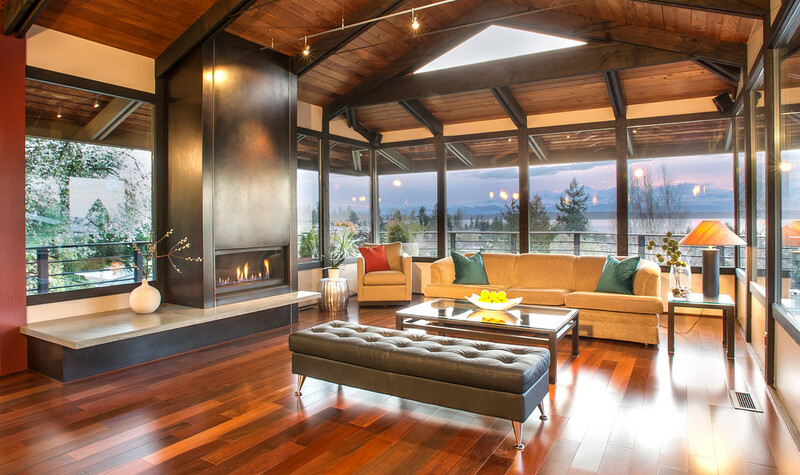 The Davis residence interior and deck work is a gorgeous contemporary take on a woodsy, Pacific Northwest aesthetic. In the waterfront neighborhood of Pine Lake, the client’s new home is inspired by the surrounding patterns of nature, embellished with live-edge wood, exposed wood beams, cleft stone, steel accents, and live-edge countertops. Axiom Design + Build believes in making a lasting impact on their community through craftsmanship and integrity. They take pride in creating functional and stunning spaces that bring together local artisans and craftspeople. Founded by Heather and John Cashman, Axiom is made up of a skilled team of 13. Heather earned her B.A. in Journalism from Arizona State University and did postgraduate studies at the Photographic Center Northwest. She also grew up watching her parents create a successful industrial construction company from the ground up. John received his B.A. in Architecture from the University of Wisconsin and a Master of Architecture from the University of Washington. Axiom considers themselves to be a firm that has fun blending construction, art, architecture, and small business. The Greenwood residence required respect for a tight budget and vision for some hip funk. The small, modern home that resulted from Axiom’s efforts is bold, urban-chic, innovative, and inviting. The structure allows space for the family of three plus their cat and dog companions, to entertain, coexist and even kick back in a movie room. Well-placed windows allows in ample natural light, and the sweet covered porch provides an added lounging option. When a Seattle couple requested help designing and building their Pacific Northwest dream house, Axiom created a drool-worthy final product, with views of Mt. Rainer, a double-height living room, two master suites, a loft-style office area, fir cabinetry, bamboo floors, a metal roof, and exposed steel trusses on the ceilings. This dynamic residence is spacious, modern, trendy, and eye catching. Fivedot believes that a unique sense of place is pertinent to a successful project. They integrate sustainability into their work as much as possible and donate 10 percent of their annual working hours to design for nonprofit organizations. Fivedot is made up of what was once two firms: Fivedot Design/Build and the Global Studio. When Fivedot Design/Build was founded, it grew from the dream of wedding the artistry of architecture with the craftsmanship of building. The Global Studio acted as Fivedot’s sister company and focused on providing design services to disadvantaged communities nationally and globally. In 2016, Fivedot Design/Build and The Global Studio combined forces to become, simply, Fivedot, and they now offer comprehensive services to communities, nonprofit organizations and private entities. Fivedot’s team includes Geoff Piper, Sharon Khosla, and Stephanie Ingram, who all received their Master of Architecture from the University of Washington. Fivedot was recognized in Residential Architect Magazine and the Seattle Times, and by the American Institute of Architects (AIA) Seattle Honor Awards. The Greenlake residence is a 3,300-square-foot, single-family home with a strong focus on sustainability. Features include a rainwater harvesting system that provides the toilets and laundry with water, on-site storm treatement, native and low-maintenance plants, reclaimed building materials, and radiant floors for heating. The residence is a 4-star Built Green certified project, and it is as beautiful as it is environmentally friendly. The fresh, bright, contemporary feeling is brought out by sliding, reclaimed wooden doors, simple shelving builtins, modern hanging light fixtures, and gorgeous French doors off the living room. The backyard cottage in Seward Park is a modern, detached accessory dwelling for a couple who are downsizing and wish to live closer to their children and grandchildren. Notable features include an exposed ceiling, custom floating stairs, an upper deck off the the bedroom, and handsome builtins in the living room. Bristol Design & Construction is a nationally recognized firm that prides themselves on their ability to offer a wide scope of services that employ efficiency, creativity, and viability in every level of a project. Principals Scott and Sandra Gjesdahl have operated their business in the Seattle area for 35 + years. Their woodworking studio allows them to craft custom cabinetry, millwork, and furniture exclusively for their own projects. The firm has won over 50 local, national and international design awards to which they attribute a visionary approach to function and aesthetic. Their work has been highlighted in 425 Luxury Living, Trends, Kitchen & Bath, Better Homes & Gardens, Luxe Magazine, Seattle Homes, Interior Design, and Portrait of Puget Sound. Recently they were honored by Sub Zero Wolf for an international award for best outdoor kitchen and Best Overall Design award in the National awards for the NKBA. We wished to create a fully functional exterior cooking zone as an extension of the indoor kitchen. The area for outdoor entertaining is quite large and flowing and the BBQ area needed to complement and integrate with that- not be segregated. This area is used nearly every day, so accessibility and ease of maintenance were a high priority. We chose to use stainless steel for the built-ins and granite counters for this purpose. The stainless appliances and cabinetry have a subdued industrial edge that compliments the architecture and main kitchen. especially difficult to deal with since it comes from all directions- including sideways. Stainless cabinetry was an obvious choice to hold up and the boxes were installed on a concrete plinth to allow for drainage to flow underneath. The exterior siding of the home also needed to stand up to the weather and time. We loved the concept of Corten Steel, but not the idea of continued rust and patination in this often humid, sub-tropical climate. An ideal solution was installing ‘Corten Steel’ porcelain tiles as siding- floating on a rain screen substrate. There will be zero maintenance, they are incredibly durable, and of course won’t rust. We didn’t want the outdoor kitchen to detract from the spectacular views. Our goal was for it to be well integrated into the architecture of the home, aesthetically pleasing and streamlined. The solid wall of the Pool House provided an ideal location for the outdoor kitchen. We extended the stainless base cabinetry from column to column and chose appliances that would integrate well. In this location, the curved clear-story roof detail, which allows for passive cooling, beautifully crowns this elevation. As an extension of the interior kitchen, the 42” built-in BBQ along with the side burner and under counter refrigerator make practically any meal possible to cook outside. Which is very desirable in this climate to keep the heat out of the indoor kitchen. We love the consistency and cohesion created between the outdoor kitchen, indoor kitchen and architecture over all. Although this is completely ‘stand-alone’, it directly compliments the architectural aesthetic of the home. The Panoramic window walls allow for a beautiful and seamless connection. The floor and ceiling planes and materials are continuous from the inside to out. This home is completely off-grid, solely powered by micro-hydro and solar. Rain water is collected then filtered through an intricate drainage system (downspouts are all integrated within the columns so none of this is visible). We’re proud to emphasize how luxury can be integrated into this flagship eco-conscious and sustainable home. The butane/propane appliances lend themselves perfectly for the occasionally overcast day during dry season (when both hydro and solar are weak).